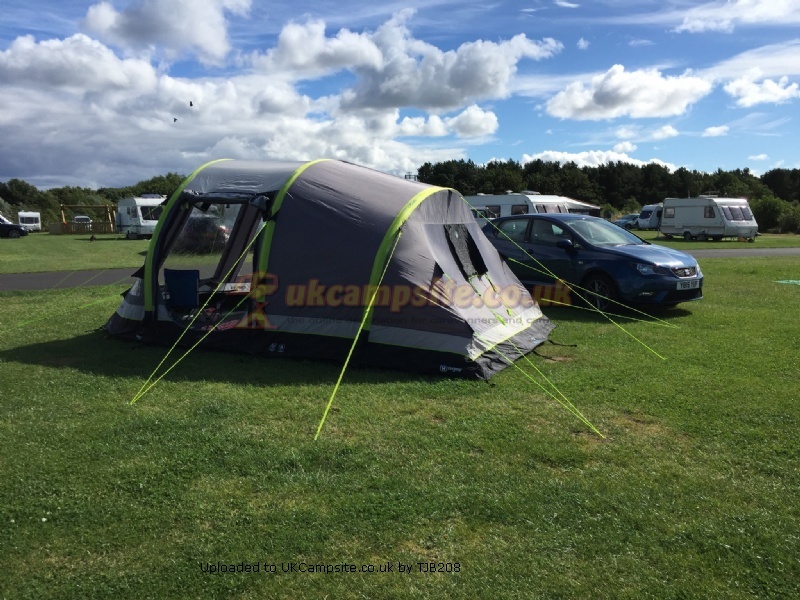 The Airgo cirrus 4 package from go outdoors, the tent itself is easy to pump and peg out and we used it a few weekends last year but were concerned about the reviews we read about the porch. We got in contact with Norwich go-outdoors and they quickly sent us the conversion kit which was basically just two more sets of guy ropes. We went camping over Easter weekend when we used the whole thing,one night was rain and wind(approx.10-15 mph) the porch without the extra guy ropes held well,unlike a cirrus 6 further down the site who's porch parted company with their tent.However after a chat and some readjusting of their strap and guy ropes the two stayed together for the rest of their holiday. We have just spent from the 4th of June till the 11th with torrential down pours and 45 mph gusts for the first part of the week. The tent was great, the porch because of the pegs being in wet ground, moved which caused separation, easily solved moved strap tightening pegs backwards,centre guy rope from front of tent(not used when porch is erected)tied to centre beam air pipe near valve. This holds the two together and the wind and rain had no chance. 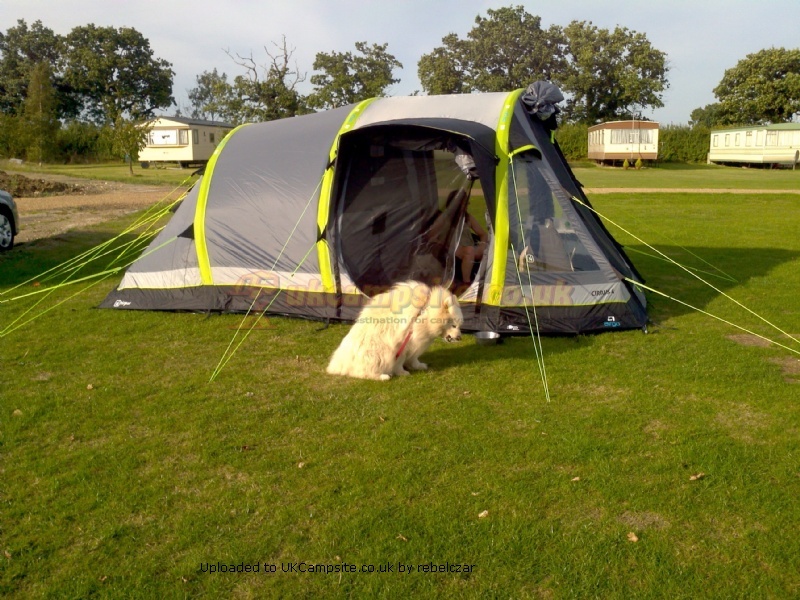 We did use one of the conversion kit guy ropes on front left hand corner of porch as that was getting full force of the wind.We love this tent and extension and with 2 hairy dogs the extra doors are very helpful always able to get a through breeze one way or another. Recently purchased from Newcastle Go Outdoors. Used for first occasion at Kingsbury Water Park in September for ten days. Weather one extreme to another. Erected in a wild and windy storm in pitch black! Not recommended, should have had a practice run first but didn't listen to my wife! Actually had trouble with the valves and blowing up the beams. I must point out that the scant instructions were poor and misleading. In the cold light of day, managed to erect the tent far easier! As most people point out, more time is spent pitching out the guy ropes, not a problem though. Tent stood up the weather well. No leaks, but front porch design is poor. Angle of porch permits rain to enter as soon as it is opened! Also, double zip is necessary! Extremely difficult to undo in the dark when wet and cold with single zip. Fault found in both fly nets, reported to Go Outdoors and to be sorted in the near future. 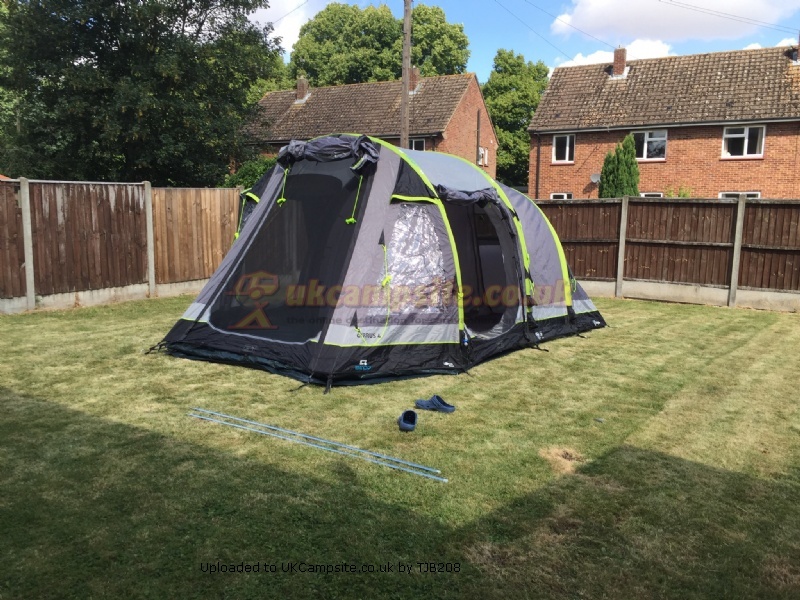 Built in groundsheet excellent, also the footprint and carpet which I would highly recommend getting if within your budget. Apart from the points mentioned, happy with our purchase and look forward to many trips in 2017. 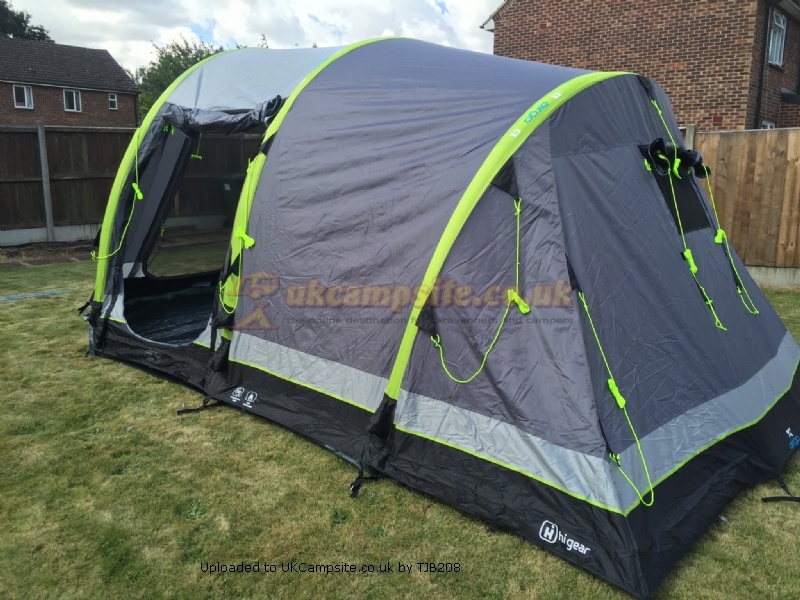 Whilst it will mostly be me camping alone I wanted a tent with lots of living area (with the English weather I didn't want to bank on being able to sit outside!). And most importantly I wanted a tent I could pitch alone. This tent fits the bill. The adverts say 50 seconds to inflate.I wouldn't say I can do it that quick - but the inflation phase probably takes me 3 minutes. With the whole set up taking half an hour. Step 1 peg out the footprint (which I'd definitely recommend buying as it keeps your tent nice and clean). Step 3 make sure all the external values are shut and then pump it up using the included pump ( you pump the whole thing up from one point). You can buy electric 12v pumps which will do this more easily. But the pump which is included does also have a pressure gauge on it. Step 4 shut the internal values which isolates each of the beams - handy in case of a leak. As part of my daily routine of tightening guy lines (we we in a very windy site) I also topped up the air but it hadn't gone down much if any at all. In the strong winds this tent was just as stable, if not more so, than pole tents. The key point was I could do all this alone as a single female. Inside it is very roomy with a large living area and 2 bedroom compartments. Normally when tents say 4man they mean 4 bodies laying like sardines, but actually with this one you can get a double air bed in each compartment. You could possible get two single air beds in each side, but didn't try it. You can also remove the divide and have one large bedroom or you can take down one half and have extra living/storage space. The bedroom compartment is held well away from the edge of the tent so there was no getting wet! We also didn't have any condensation with two of us sleeping in the tent (but it wasn't very wet and rainy to be honest). It is tall and so you can stand up in the main living area and at 5'5 I could stand in the bedroom pretty much too. There are storage pockets in the sleeping compartments and also in the main area and lantern hanging points too. There are 3 doors which was great because as the wind changed we could use a different door. One of the side doors also has a small overhanging canopy which I guess would be useful when raining. Poles are provided to raise the main front door up into a porch, but equally could be used on the side door (you would just need to attach extra guy lines). Each door is clear plastic so let's in lot of light but also has a Velcro 'curtain' and a zipped mesh net which was really handy. There is a window vent on the back wall as well which can be zipped open or shut. 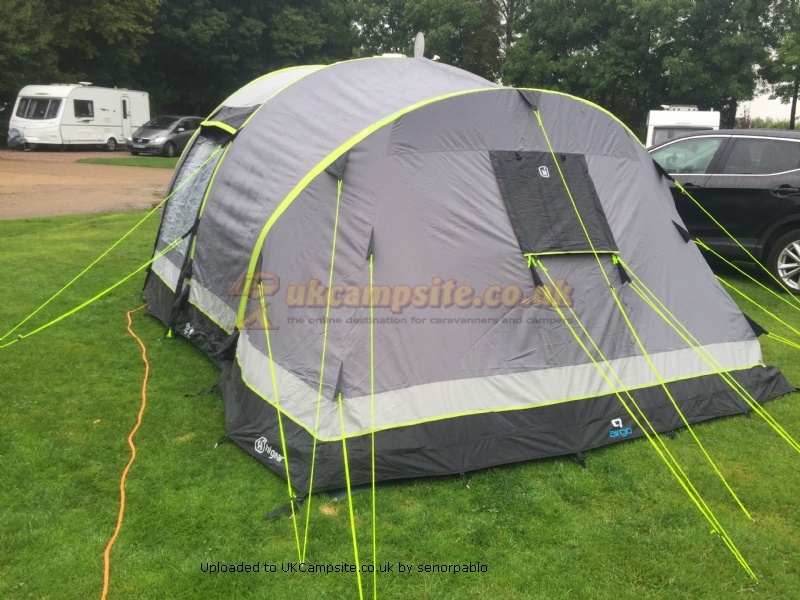 The air beam ridges and guy lines are also fluorescent green which was handy when finding the tent in the dark! Very easy to deflate and pack up. The key is to fold the ends in and then roll towards the open valves. The bag it comes in is oversized and so had no problem getting it back in. Plenty of steel pegs are provided - more than needed so spares. No mallet included or tent peg remover both of which are recommended. The downside? The bag is large, bulky and heavy. So not a tent if you are short on space in your car or have a long distance from the car to where you are pitching (unless you have a trolley or wheelbarrow). 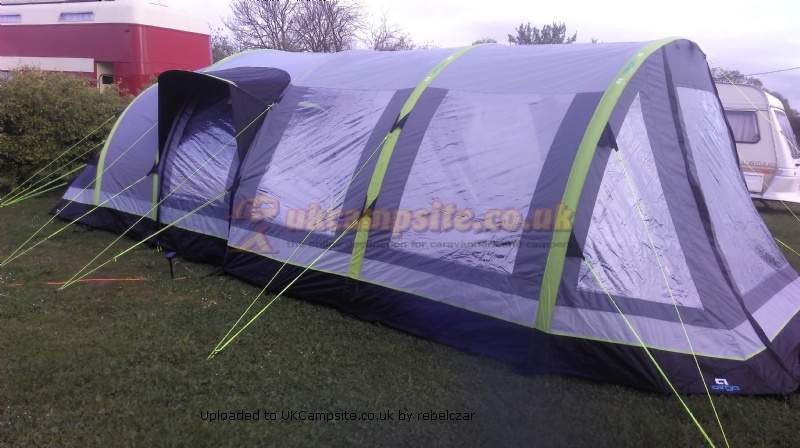 It is more expensive than a pole tent of the same size. But for me it gives me the freedom of being able to go alone. Can't comment on its longevity yet but very much recommend it as a tent at this point. Add your review of the Airgo Cirrus 4! 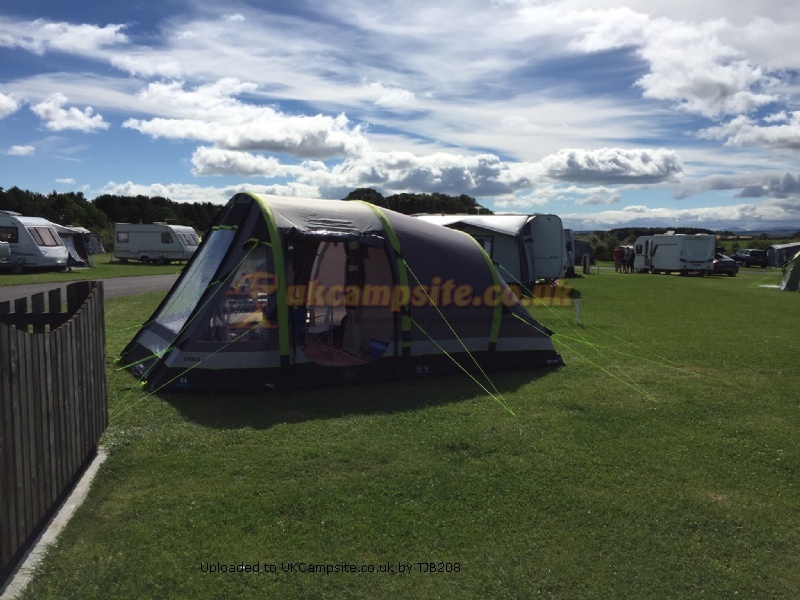 The Airgo Cirrus 4 is an easily pitched, roomy tent that can accommodate 4 campers and their gear with space to spare. Part of the Airgo range by Hi Gear, it takes the hassle out of setting up your tent. Built using highly robust double skinned beams that are simply filled with air using the included stirrup pump, it provides a rigid pole-free frame in minutes. Setup is simple, quick and easy - all the beams are connected so they inflate from a single inflation point. The Cirrus 4''s superb build quality, with strong guying points and multiple guy lines, ensure that it will stay stable and in one piece even in harsh weather conditions.